Metal Gear Solid 4: Guns of the Patriots (メタルギアソリッド4) (commonly abbreviated to MGS4) is a Stealth action video game in the popular Metal Gear series. 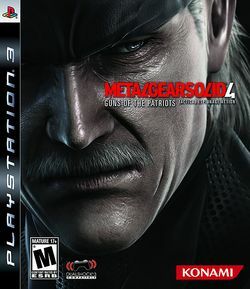 Directed by Hideo Kojima, Shuyo Murata and Yoji Shinkawa, Guns of the Patriots was developed by Kojima Productions exclusively for the PlayStation 3 video game console. The game, designed around the motto, "No Place to Hide! ", is the last Metal Gear game developed by Hideo Kojima, and the last game in the series starring Solid Snake. The game was released worldwide on June 12, 2008, 10 years after the release of Metal Gear Solid and 20 years after the first Metal Gear. This page was last edited on 31 December 2009, at 16:29. This page has been accessed 12,467 times.